In this article I'm going to review two photography eBooks aimed at the novice or beginner photographer. They are both very different in their approach to the same material, and both valuable in their own way depending on your needs. If you can answer “yes” to any or all of the points below, please read on as you may find one or both of these eBooks a great starting place for your photography learning journey. Did you recently buy a new DSLR? Do you wish you could get off AUTO but don't know where to start? Do you want to understand the terminology in the manual but they're simply Greek to you? You want to understand all the buttons and settings on your camera better? You want to have more control over how your images look? next step, where do you go from the end of the book? On a scale of one to five for user experience, I'd rate this book a five! The tone of the book is inviting and it has a casual, encouraging feel. There are even little cartoon characters that give you messages of encouragement along the way. The design is nice, it's well laid out, and easy to read and follow the information. There are layperson explanations of photography jargon terms, and information is laid out in a logical progression. They've even included seven short videos to illustrate some of the basics, things which cause many students to have questions about, or get stuck. It's also iPad and device friendly! All in all, and good experience for the reader. So even though I think it could go into more detail in some areas, for the absolute beginner it gives just enough information to start to learn the controls and get off Auto. There are diagrams for settings with both Canon and Nikon, as well as “other” brands to make it easy to follow no matter what camera you own. It's a good base if you just want to get some facts, in an easy to understand manner and use your camera with more confidence. The image examples and videos do a really good job of explaining the material in each lesson. There are several diagrams that illustrate complex concepts like exposure, and depth of field. The book shows what to look for on your camera settings and what it should look like in your view finder (when you look through the eye piece) as well. In beginner photography I find it is key to see cause and effect to really grasp what is happening. Extremely Essential Camera Skills does a good job demonstrating that how certain settings change the image and how the the resulting image looks. There is a glossary of terms provided at the end of the book, as well as links to a Flickr group for sharing images, their main Photography Concentrate website and Facebook page. Other than those links there is not a lot of other outside links offered for further learning (i.e. articles on the website), examples or research. Not sure this is all that important as it gives you what you need inside a neat package, but if you're the type that wants more there isn't much offered here. A printable Field Guide is also provided, along with instructions on how to print and fold it. This is a really handy way to take a one page reference sheet with you, when you're actually out doing photography. So if you are inclined to try your hand at making albums or photo editing, then you might want to pick up one of the titles above. If you want to continue learning more about your camera and its settings read on to the second review below! Overall rating 3.8 out of 5 for Extremely Essential Camera Skills. Keep reading to see which book is best for you, or maybe both. Like the first eBook this one is very well laid out, both in its actual page layout and design, and in the flow of information. Each chapter is arranged in a logical sequence with homework, resources and reader comments at the end of each section. The only reason I give it 4 and not 5 on user experience is the animated illustrations do not play on the iPad or iPhone. Perhaps there is another viewer for those devices that does take advantage of the moving diagrams, if you know of one and it works for you please tell me! Putting this information into the notes in the book introduction would be helpful. Photo Nuts and Bolts picks up where Extreme Essential Camera Settings leaves off in terms of technical details. It goes into a lot more depth explaining complex things including lens optics and the physics behind photography. In fact it explained aperture and the f-number so well that I have adopted the same method for explaining it to my beginner photography students. If you are a person that likes to know the” how and why” behind how things work, you will really get into this book. Overall though this ebook gets you thinking about lenses and other mechanics of photography in a way that helps your brain make sense of them. There are also some really inventive exercises to demonstrate that, see below for more. For the most part the example diagrams and images are very well done and appropriate illustrations of the lessons. If you are viewing on your computer and the moving diagrams work for you, they are really quite helpful to understanding complex concepts including how the shutter works, and lens refraction. There are a couple of the image examples I actually disagree with, but that may come down to shooting and teaching style so I'll let you be the judge on that point. Overall the illustrations and examples are very appropriate and well thought out. There are certainly an abundance of homework or practice assignments in the Photo Nuts and Bolts ebook, 39 in total to be exact. For some of the chapters the author, Neil Creek, got really inventive including telling you how to build a “camera obscura” or a “pinhole” camera. In the chapters on the main camera settings there are good exercises to help you learn how they work, and how the adjustments you make affect the image. The only reason I rated it a four out of five, is that I felt some of the exercises could have had more explanation on how to do them, such as starting camera settings. As I mentioned earlier, at the end of each section is the homework assignments and links to outside resources. I clicked on many of them and found some things I wasn't aware of that were also very helpful in adding to information on the topic at hand. There is also a glossary of terms and instructions on how to read the diagrams provided in the book. 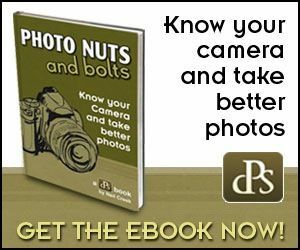 Similarly to the first book above, Photo Nuts and Bolts also includes a printable field guide with starting exposures to help you in various settings. Sometimes it helps to read the same information explained a few different ways, by different teachers, so that it sinks in and becomes second nature. This book is very good at providing other resources and sources of information. It is my belief that smart teachers share information from other teachers, or writers, and aren't threatened by doing so. As a beginner in photography I suggest becoming really good at being a sponge and absorbing all the information from as many sources as possible. In addition to those two titles, this book is produced by Digital Photography School and is one of 14 ebooks they offer. You can see the entire library of Digital Photography School eBooks here! They even have a special if you want to buy all 14 and continue your learning and save money at the same time. Check it out! Overall rating 4.3 out of 5 for Photo Nuts and Bolts. Keep reading to see which book is best for you, or maybe both. Both books come with a 60 day money back guarantee. If you don't feel you've received value or improved your photography skills, they will refund 100% of your money. So it's risk free to try either or both. I hope you found these reviews helpful. If you are an amateur, or novice photographer who is just beginning I suggest you take a look at them. If they are a bit too beginner for you, look for my new class “4 Steps to Better Photography” a self paced online class, coming soon! HINT: eBooks also make great stocking stuffers – think ahead for the photography enthusiasts in your life!